In response to the ‘Fake News’ and ‘Alternative Facts’ doctrine twittered so incoherently from the Trump White House, people have remembered George Orwell’s Doublethink and Newspeak, and sales of 1984 have boomed in the USA. No doubt we shall soon appreciate anew the Orwellian warning that Big Brother is Watching You. The revelations by Edward Snowden still linger in our consciousness as a reminder of the caution. Some of the twists and turns in the story of private surveillance will be familiar to the modern reader, even if they were mostly not to Orwell. The activities of the Pinkerton National Detective Agency, with its motto ‘The Eye That Never Sleeps’, are an example. And it wasn’t just the Pinkertons. There was a mushroom growth in private detective agencies in late nineteenth century America. The spied on two targets were the principle source of their profit. The first were workers who tried to unionize or draw attention to unsafe working conditions. The second, with divorce booming by the 1920s, was the family bedroom and its adulterous extensions. More of a surprise to me, when I looked at it, was the role that credit agencies played. Lewis Tappan, the anti-slavery radical who championed the Amistad case, was, less famously, a pioneer of the creditworthiness assessment industry. His firm listed and graded 800,000 US businessmen by the end of the nineteenth century, having subjected them and their habits – alcohol consumption, gambling, sexual behaviour – to surveillance by 10,000 professional informers. Today, business surveillance manifests itself in shapes with which we are familiar, even if Orwell and Snowden ignored them. Do you have a supermarket credit card? It is watching you and bending your mind through targeted advertising. Some of the most intrusive surveillance has been not governmental, but private. Private surveillance is multi-faceted, and is with us to stay, particularly the unsavoury history of anti-labour surveillance. It took many forms, ranging from spying on bathroom visits to identifying activists and blacklisting them. Ralph Van Deman and ‘Blinker’ Hall, heroes of wartime military intelligence in America and Britain respectively, both set up private anti-labour spying units in the 1920s. Such surveillance continued into the twenty-first century, and now shows signs of reviving in Trump’s America and May’s UK, where The Consulting Association is the successor to Hall’s Economic League. Which of our major construction projects, ranging from Crossrail to the new Forth road bridge, has been free of surveillance-and-blacklisting controversy? Attempts to curb government surveillance have yielded at least partial success, and have received media attention. In spite of the prevalence of blacklisting in our society and the phenomenon of merciless hacking and other intrusiveness by mass-circulation newspapers, less constructive attention has been paid in our two democracies to the excesses of private surveillance. One reason for the strength of the headwind is that the press is privately owned, responsive to private business interests, and indisposed to report favourably on proposals for its own reform. When it does listen to surveillance grievances, they are those of the middle classes concerned with their own right to privacy. So how impartial has our ‘free’ and ‘truthful’ press been? I argue that Orwell and Snowden, with their blinkered ‘statist’ preconceptions, also carry a share of the responsibility. For whatever reason, we have not properly addressed some of the kinds of surveillance that have done the most harm. Featured image credit: Cameras Traffic Watching Surveillance by PublicDomainPictures. Public domain via Pixabay. Rhodri Jeffreys-Jones is Emeritus Professor of American History at the University of Edinburgh and has held postdoctoral fellowships at Harvard, the Free University of Berlin, and Toronto. The founder of the Scottish Association for the Study of America, of which is he the current honorary president, he has also published widely on intelligence history, including The CIA and American Democracy (1989), The FBI: A History (2007), and In Spies We Trust: The Story of Western Intelligence , the last of these also published by Oxford University Press (2013). He was the winner of the 2014 Neustadt Prize for the best UK book on American politics with The American Left: Its Impact on Politics and Society (2013). 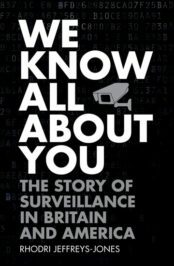 He is the author of We Know All About You: The Story of Surveillance in Britain and America.